Laing is made up essentially of dried and shredded taro leaves, bits of meat or shrimp paste, generous amount of red chillies, ginger, garlic, and onion cooked in coconut milk. 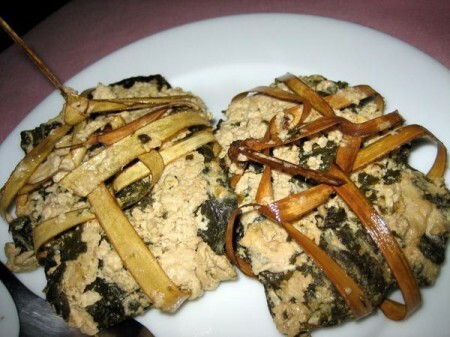 Bicolanos consider cooking the ingredients steadily in coconut cream because stirring it can also make the throat itchy. 1. Sauté garlic and onions in oil. 2. Stir in ground pork and bagoong. Add in Aji-Ginisa.Cook for 5 mins. 3. Let pork mixture cool and divide into 5 portions. 4. Wrap each portion with gabi leaves. 5. Arrange wrappings in a pan and pour in coconut milk and let it simmer for 5 mins. 6. Add paprika and hot sauce.